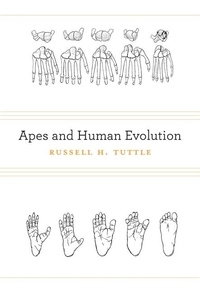 In this masterwork, Russell H. Tuttle synthesizes a vast research literature in primate evolution and behavior to explain how apes and humans evolved in relation to one another, and why humans became a bipedal, tool-making, culture-inventing species distinct from other hominoids. Along the way, he refutes the influential theory that men are essentially killer apes--sophisticated but instinctively aggressive and destructive beings. Situating humans in a broad context, Tuttle musters convincing evidence from morphology and recent fossil discoveries to reveal what early primates ate, where they slept, how they learned to walk upright, how brain and hand anatomy evolved simultaneously, and what else happened evolutionarily to cause humans to diverge from their closest relatives. Despite our genomic similarities with bonobos, chimpanzees, and gorillas, humans are unique among primates in occupying a symbolic niche of values and beliefs based on symbolically mediated cognitive processes. Although apes exhibit behaviors that strongly suggest they can think, salient elements of human culture--speech, mating proscriptions, kinship structures, and moral codes--are symbolic systems that are not manifest in ape niches. This encyclopedic volume is both a milestone in primatological research and a critique of what is known and yet to be discovered about human and ape potential.